After moving into their new home, a keeling-over farmhouse in the country, nine-year-old Cyrus and his brother, Rudy, have trouble adjusting to all the changes. The fresh-from-the-farm egg yolks are blindingly yellow. The eccentric girl next door has a very unusual sense of style. And Rumpley, a donkey they inherited with the farmhouse, doesn't even know how to bray. Nothing about the country feels warm or familiar. But when Cyrus is stranded one evening by the tide, he finds his lifeline in an unlikely companion. Blackberry Juice is the sequel to Not For Sale. 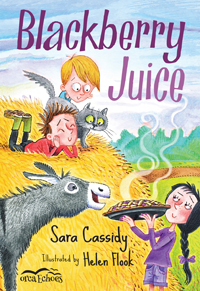 "This delightful 'early reader' novel is captivating and entertaining...This book should be a popular addition to an elementary school library or a classroom collection." "This appealing title is humorous, short, and hard to put down. 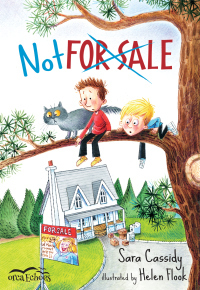 Newly independent or reluctant readers looking for a good laugh or who are dealing with moving will appreciate this lighthearted, warm tale." 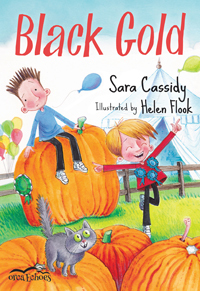 "Flook's cartoon illustrations enhance the simple, amusing text that is peopled with warm, engaging characters...and a gently nuanced animal relationship. Short chapters and a limited vocabulary make this a fine choice for emerging readers. A summertime visit to the countryside with people who are fun to share time with. What could be better?"